The project is to develop an ammonia production process which is less energy intensive than the conventional Haber-Bosch process and does not contribute to any greenhouse gas emissions. Ammonia is currently mostly produced from fossil fuels by the highly energy and carbon intensive Haber–Bosch process, which requires temperatures of 450-500 °C and pressures up to 200 bar. The energy consumed by the process is 10-15 kWh/kg. The proposed process will develop the technology to produce ammonia from renewable sources of energy with 25% less energy input per tonne of ammonia. 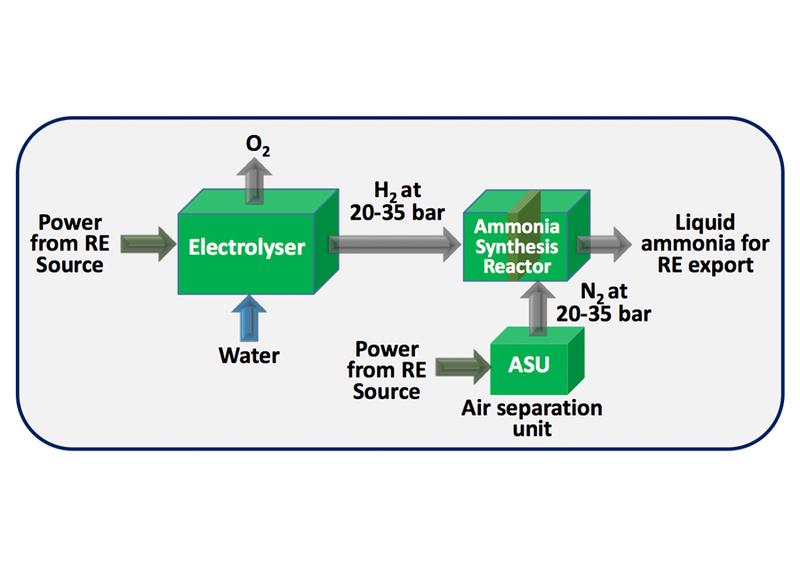 A prototype ammonia producing reactor will be built to demonstrate the operation with electricity supplied by a solar PV, thus showcasing the technology potential for export of Australia’s vast renewable sources of energy. Hydrogen can be produced by electrolysis of water using electricity from renewable sources of energy such as solar PV and wind turbines. CSIRO’s membrane based process converts hydrogen into ammonia, a liquid fuel with minimal further consumption of energy and at a scale suitable for distributed ammonia production from renewable sources. This route and the technology thus provides an excellent means of storing and transporting renewable energy for end use applications such as power generation or as a feedstock for other chemicals resulting in an emission-less energy cycle. The technology will allow ammonia production at much lower pressures (10-35 bar), and therefore can directly source hydrogen from an electrolyser and nitrogen from an air separation unit (ASU) eliminating much of the balance of plant. The technology, thus reduces the required energy input per tonne of ammonia and is less capital intensive making it suitable for use with renewable sources. The process therefore will offer significant improvements in efficiency and lower levelised cost, facilitating the use of ammonia as an energy vector for renewable energy export and end use applications.